<strong>ANTI-ANTENNA BRIGADE:</strong> The move to put up more than 100 wireless data antennas throughout southern Santa Barbara County is riling some residents. 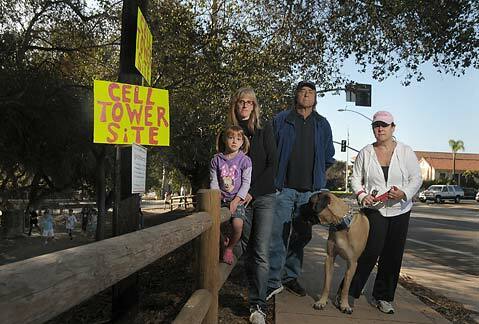 Topping that list are (from left) four-year-old Arielle; Arielle's mom, Cindy Feinberg; Don Miller; and Carrie Haffner; as well as other parents and neighbors of Montecito Union School, where an antenna is proposed across the street from the playground. 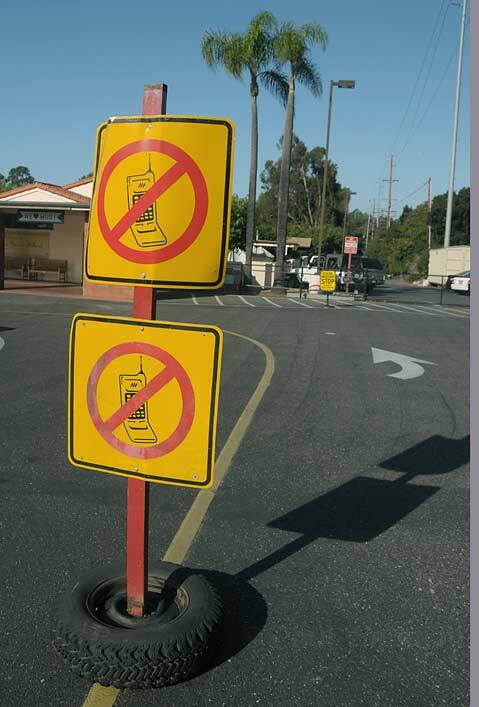 "There are people involved in big cellular companies, pushing their way into our communities without any ability for us to speak about placing these things away from our residential neighborhoods," said Goleta's Yuri Zelez, whose bedroom is 25 feet from a proposed antenna. "It's like, 'Bend over and take it.' Forget it. I'm not doing that." fueled by fears that the antennas might emit a dangerous form of electromagnetic field (EMF) radiation-is riling some residents, though it’s likely that only a fraction of people who live, work, or play near a proposed antenna have any idea about it. Because of the uproar, the Board of Supervisors will be discussing the 39 antennas proposed for the county in a public forum on October 20. But in the cities of Santa Barbara (70 antennas proposed, though most sent back with a request that the control box be put underground), Carpinteria (seven proposed), and Goleta (19 proposed and “pretty much in the bag” according to one planning official), the antennas march forward with citizens mostly unaware. Not that there is much that could be done anyway. NextG’s public utility status grants numerous exemptions because its technology is deemed an “essential service,” and the technology is governed by the Federal Communications Commission, the sole governmental entity tasked with setting public health and safety standards for such devices. So despite EMF concerns, official appeals cannot be based on health, only on aesthetics and evidence that further coverage is unwarranted. “We can’t go beyond FCC regulations. We’re preempted in that regard,” said county planner Dave Ward, who’s helped process these applications and requested that NextG at least show its technology does comply. “As you can imagine, it’s frustrating for the public to hear that the level of review is focused on aesthetics. I don’t think we’ve been able to satisfactorily satisfy their concerns.” Although the technology and placement of antennas on existing utility poles is new, Ward says they’re covered under the county’s wireless telecommunications ordinance. “It’s not something we’ve seen in the past, but it does fit within our ordinance,” said Ward, who explained that county policy requires a sign marking each proposed antenna and that residents within 300 feet of a site be notified. NextG’s spokesperson Sharon James was emailed questions on Monday and had not replied as of Wednesday’s press deadline despite repeated inquiries. In general, NextG uses the two- to three-foot-tall, omni-directional “whip” antennas and accompanying control boxes-referred to collectively as “nodes”-to establish wireless networks in a selected community and then leases the coverage to big cellular companies such as AT&T. The company has successfully created similar networks in other parts of the country, and James has repeatedly cited San Diego as a successful California community network in her meetings with county planners. But one place where NextG hasn’t been successful is Long Island, New York, where a wave of outrage occurred when the company proposed 170 antennas throughout the 22 communities that make up the Town of Hempstead. According to a September 10 story in Newsday, the community of Merrick filed a $100-million lawsuit against the company because property values would be driven down by the perceived health risk. NextG then ceased negotiations with the town government, explaining to one resident that the money they would have used to re-site some of the controversial antennas now had to be spent on legal defense.